The current exhibition inside the Museum for Insects is inspired by the exhibition that is just outside our walls, Engineering Utopia, curated by Kris Paulsen. "Engineering Utopia is premised on the idea that utopias are places or situations consciously built and conceived - engineered - for perfection, but also bound to remain hypothetical, unrealized, and imaginary. This exhibition examines interactions between artists and engineers from the late 1960s to the present, and how the context of art allowed them to dream greatly and 'fail' wildly." Engineering Mini Utopia, is our version of the show, which features miniature works by many of the artists in the larger show – Ken Goldberg, Isla Hansen, Ken Rinaldo, Lillian Schwartz, and Stan VanDerBeek. 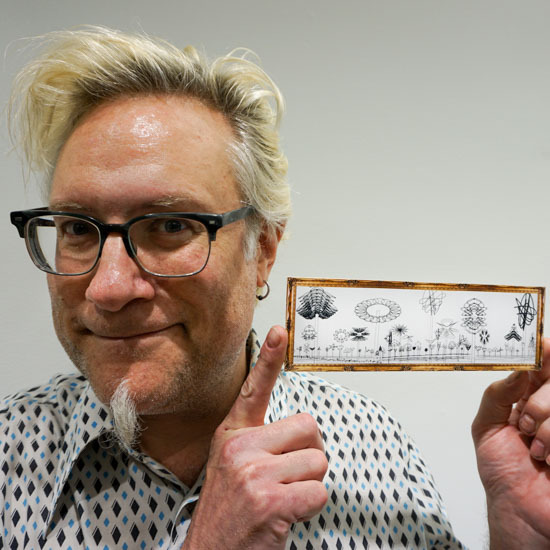 Works by additional artists – TradeMark Gunderson, Tucker Marder and Jim Wilson – were invited into the exhibition to address the cricket audience and to further the utopian ideals of communication between technology, insects and humans. Media: 3D rapid prototype and paint. A mini model of the Telegarden is on display at the Museum for Insects. The original artwork, online continuously from 1995-2004 at the Ars Electronica Museum, set a precedent as the first internet-enabled robot. Members could plant, water, and monitor the progress of seedlings via the tender movements of an industrial robot arm. The larger exhibition, Engineering Utopia, is showing research notes about a potential restoration version of this historic artwork by the Ohio State University's College of Engineering. 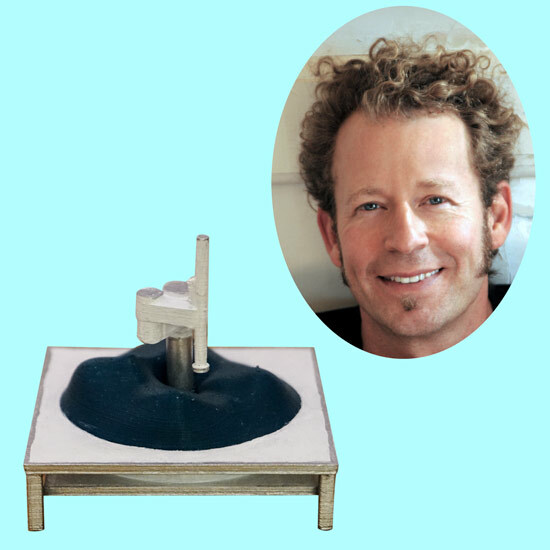 Ken Goldberg is an artist, inventor and professor. He is Chair of the Industrial Engineering and Operations Research Department and Director of the CITRIS "People and Robots" Initiative and the UC Berkeley AUTOLAB where he and his students pursue research in geometric algorithms and machine learning for robotics and automation in surgery, manufacturing, and other applications. 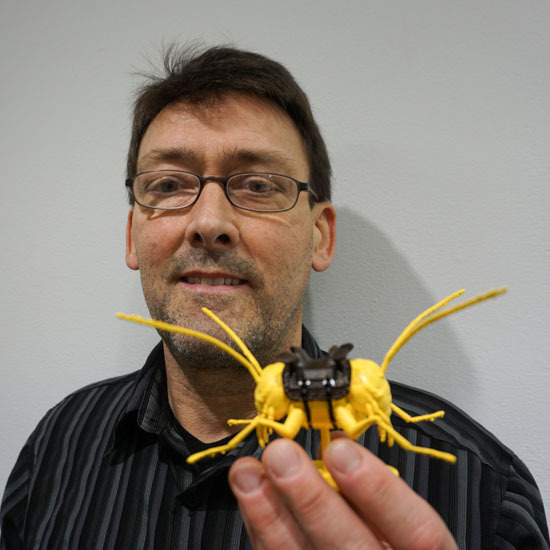 Ken developed the first robot on the Internet and he has over 200 peer-reviewed publications, and eight U.S. Patents. His artwork has appeared in 70 exhibits including the Whitney Biennial. Ken was awarded the Presidential Faculty Fellowship from President Bill Clinton in 1995, elected IEEE Fellow in 2005 and selected by the IEEE Robotics and Automation Society for the George Saridis Leadership Award in 2016. A cricket-sized algorithmic landscape drawn by a robot that was created and programmed by the artist. 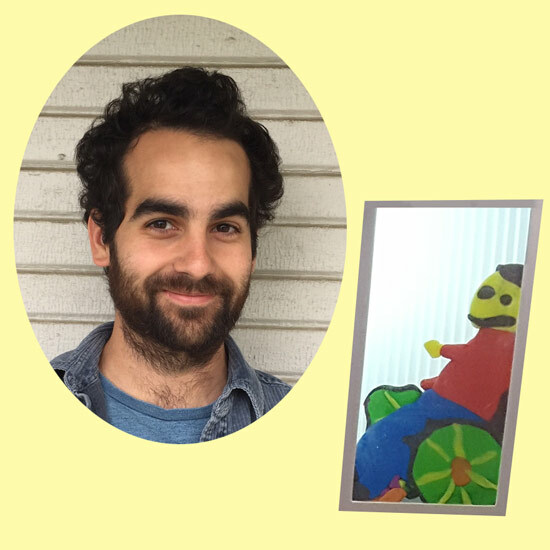 TradeMark Gunderson is a technology artist and musician determined to remix everything. Using repurposed old and new technology, his artwork inspires unexpected insights into how we perceive and interact with our increasingly digital world. Music composed and performed as The Evolution Control Committee has inspired new genres of music and challenged the role of copyright, remaining controversial to this day. TradeMark and The ECC have appeared on networks from CNN to C-SPAN, in print from Spin Magazine to the Macmillan Dictionary, and in person giving around 1,000 performances and presentations at festivals, concert halls, bars, and galleries all over the world. Media: silicone, polymer clay, foam, microcontroller, servo. An interactive, seductive, reproduction of a reproductive organ. For crickets! Isla Hansen's work reenacts forms of popular media, play, and systems of production, recreating ways in which bodies connect to technologies in the world around us. Evoking the association of image to desire, idolatry, ideology, and learning, these absurd systems reinterpret and complicate the relationship between the body and technological progress. Tucker Marder uses humor and absurd scenarios to generate greater empathy for the natural world in works of art that combine theater, puppetry, and installation. In 2014 Tucker founded the Folly Tree Arboretum, an arboretum intent on showcasing nature's sense of humor. Tucker Marder uses humor and absurd scenarios to generate greater empathy for the natural world in works of art that combine theater, puppetry, and installation. In 2014 Tucker founded the Folly Tree Arboretum, an arboretum intent on showcasing nature's sense of humor. 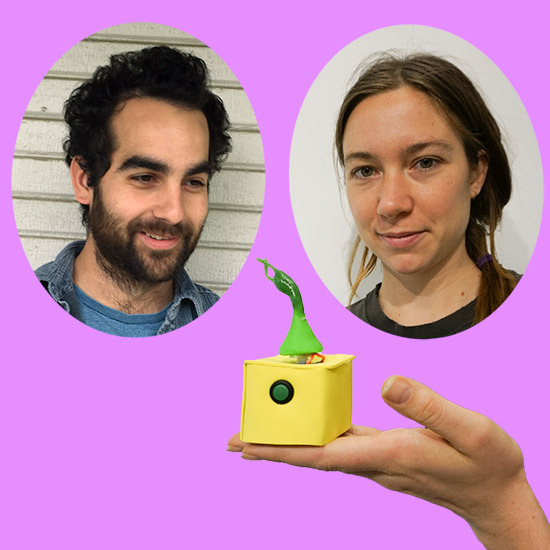 Ken Rinaldo is an artist and educator internationally recognized for his interactive robotics and bio-art installations. He seeks to merge the organic and electromechanical seamlessly through sonification, interactivity and motion, expressing a gentle symbiosis. His works are influenced by living systems theories, interspecies communication, artificial life research, and the idea of emergent properties. Rinaldo’s works have been commissioned by museums, festivals and galleries internationally and he has won numerous awards, such as an Award of Distinction at Ars Electronica Austria for Augmented Fish Reality and first prize for Vida 3.0 Madrid for his work Autopoiesis, which also won an honorable mention in Ars Electronica in 2001. Lillian Schwartz is a pioneering artist in the field of art and technology. Her work was the first in this medium to be acquired by The Museum of Modern Art. She has created kinetic art, computer-generated graphics, film, video, animation, special effects, Virtual Reality and Multimedia. Schwartz began her computer art career as a member of the Experiments in Art and Technology (E.A.T.) group in 1966. She then expanded her work into the computer area, becoming a consultant at the AT&T Bell Laboratories. Schwartz's films have won awards at the Venice Biennale, Zagreb, Cannes, The National Academy of Television Arts and Sciences, and the Emmys. Her work has been exhibited at The Metropolitan Museum of Art, The Whitney Museum of American Art, The Museum of Modern Art, The Moderna Museet (Stockholm), Centre Beauborg (Paris), Stedlijk Museum of Art (Amsterdam), and the Grand Palais Museum (Paris). Stan VanDerBeek (1927 - 1984) was a pioneer in the development of experimental film and live-action animation techniques, who achieved widespread recognition in the American avant-garde cinema. An advocate of the application of a utopian fusion of art and technology, he began making films in 1955. In the 1960s, he produced theatrical, multimedia pieces and computer animation, often working in collaboration with Bell Telephone Laboratories. 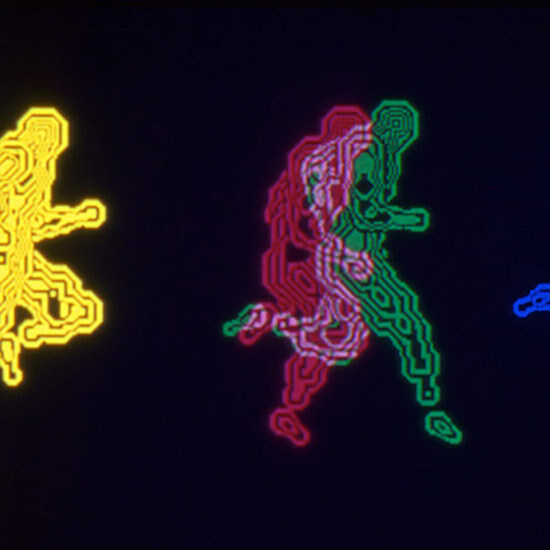 His multimedia experiments included movie murals, projection systems, planetarium events and the exploration of early computer graphics and image-processing systems. VanDerBeek was also intimately involved with the artists and art movements of his time; he filmed Happenings and merged dance with films and videos. VanDerBeek was a preeminent thinker, scientist, artist, and inventor who forged new links between art, technology, perception, and humankind. In 1966, he wrote a visionary manifesto about man losing his way in his place on earth and the power of artists to rectify the course. "This recording began as an actual live recording of crickets singing in the night. 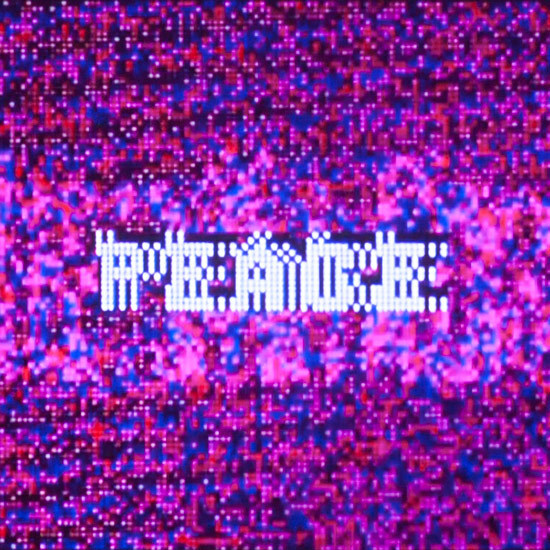 I discovered that when I slowed down this recording to various levels, this simple familliar sound began to morph into something very mystic and complex........almost human." Jim Wilson (1946 - 2012) instrumentalist, composer and producer of contemporary Native American music. He was dedicated to the idea of music as a conduit for world peace - joining time, distance, religions, people and even animals together. He played music in the Little Wolf Band and was the producer of several spiritual albums, such as the Grammy Award winning Sacred Ground, and a posthumus album with pop icon Timothy Leary for Mercury Records. He collaborated with Robbie Robertson on a number of projects, including the soundtrack for "The Native Americans", a six-hour documentary for TBS and the album "Music for the Native Americans". The documentary series won three Emmy awards and the album sold over a million copies worldwide. 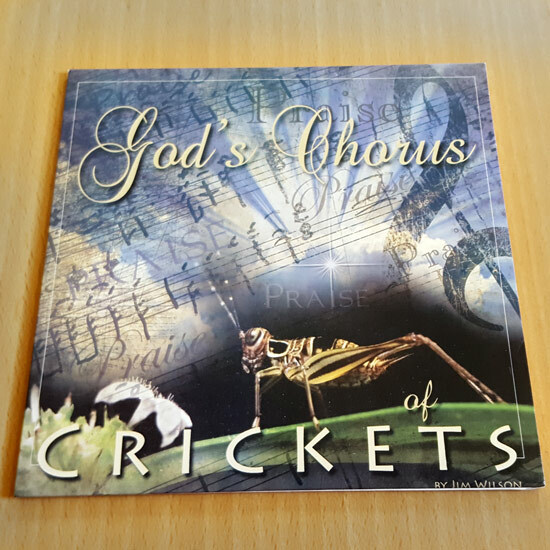 His God's Chorus of Crickets recording became viral on the internet after his death. It has garnered its own Snopes page and to this day people are discussing, arguing, and attempting to reproduce the recording.